And when the days of Pentecost were drawing to a close, they were all together in one place. And suddenly there came a sound from heaven, as of a violent wind coming, and it filled the whole house where they were sitting. And there appeared to them parted tongues as of fire, which settled upon each of them. And they were all filled with the Holy Spirit and began to speak in foreign tongues, even as the Holy Spirit prompted them to speak (Acts 2, 1-4). The feast of St. Bernadine of Siena, which is ordinarily celebrated today, is superseded by the Sunday liturgy. After Jesus had ascended to heaven from Mt. Olivet, the apostles and disciples returned to the Holy City. They remained together in the Upper Room or Cenacle, the place where Jesus had appeared to them and which may well be called the first Christian church. About a hundred and twenty persons were assembled there. They chose Matthias as an apostle in place of the unhappy Judas; they prayed and waited for the Paraclete. Ten days had passed, it was Sunday, the seventh Sunday after the resurrection. At about nine o'clock in the morning, as they were together praying fervently, the Holy Spirit descended upon them. Note how all the great theophanies in Christ's life occurred during the course of prayer. After His baptism, for instance, when Jesus was praying the heavens opened and the Holy Spirit descended in the form of a dove; likewise, it was during prayer at night that the transfiguration took place on Tabor. Surely too it was while Mary was praying that Gabriel delivered his message, and the Holy Spirit overshadowed her. 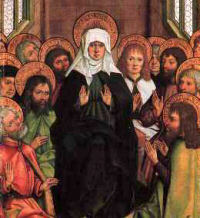 Pentecost followed precedent. The small community of Christians had prepared themselves through prayer for the coming of the Paraclete. The same is true at Mass today, every day; through prayer we ready our souls for the advent of the Spirit. Today at Mass, particularly at holy Communion, the power of the Holy Spirit will come down upon us; fiery tongues will not be seen, but invisible tongues of fire will not be absent. There was still another external manifestation of the Holy Spirit; the apostles and disciples were enabled to speak various languages. After the roar of the wind many of Jerusalem's pilgrims hurried to the Cenacle. Pentecost was one of the three festivals which obliged all Jews to be present in Jerusalem. Jews from distant lands, and Jewish converts from paganism too, attended these feasts. As a result, a colorful crowd speaking a variety of languages surrounded the house. Now the apostles, who so shortly before had hid in fear behind locked doors, came forth and courageously walked among the multitude speaking to each in his native tongue. It was indeed amazing! Galileans, and multilingual? But the malicious too were present; they had the answer. Nothing marvelous at all! Those Galileans were simply drunk, and their drunken babble sounded like a foreign language! Peter showed no hesitation in answering the charge. None of their number, he said, were intoxicated; it was but nine o'clock in the morning, and at that hour men usually are sober. What the multitude saw was, in fact, the fulfillment of Joel's prophecy: In those days (of the Messiah), God will pour forth His Spirit upon men and they will prophesy. . . . Then the apostle pointed his words more directly against the accusers: they had killed Jesus, had nailed Him to the Cross; but God had awakened Him and after His departure to heaven, He sent the Holy Spirit. The pilgrims who had heard Peter give this first pentecostal sermon "were pierced to the heart and said: Brethren, what shall we do? But Peter said to them: Repent and be baptized; and you will receive the gift of the Holy Spirit." Three thousand responded. One final question: why the miracle of tongues? In answer, recall the story regarding the tower of Babel. Puffed up by pride, men attempted to build a tower that would touch the heavens. To punish their sin, God confused their speech. Sin causes confusion and division. Now Christ came to gather all men into His Church and thereby to unite them to Himself. This should result in creating but one family of nations again. To this blessed state the miracle of tongues points. Yes, even we as individuals have a gift of tongues which all men can understand. It is the gift of love infused into us by the Holy Spirit. Love unites, love is a common language, by means of love we can speak to all nations. Meditate on Fr. Roger Landry's homily for Pentecost Sunday. "Suddenly there came a sound from heaven , as of a violent wind. . .it filled the whole house. . .And there appeared to them parted tongues as of fire, which settled upon each of them. And they were all filled with the Holy Spirit" (Epistle). On Christmas we celebrate the birthday of Christ in His Physical Body. Today is the birthday of the Church, of all those who have been reborn into His Mystical Body. How did the first Christians prepare? They were all "in prayer" with Mary; and they were "all of one mind," under the leadership of Peter, making ready to tell "men from every nation under heaven. . .of the wonderful works of God" Epistle). Yes, prayer and action are the marks of the true Christian. In the Offertory we ask the Holy Spirit to "confirm" the graces "wrought in us" when we were baptized and confirmed. We pray also "to relish" things of the Spirit and to benefit by "His consolation" (Prayer) in the struggle of Church and soul against "the prince of the world" (Gospel).